The MyTime – Book All Your Appointments Online! iPhone, iPod Touch, and iPad is a virtual personal assistant that books your appointments with simple tools and intuitive navigation. The synthesis of smart, thorough filters and fantastic service makes it a huge help for people juggling life on an iPhone and businesses who want to maximize technology resources to attract more clients. The free iTunes App Store download makes you feel like you have hired help, but without the hassle, worry, and payroll. A simple authorization to permit location services leads to a feed filled with service providers listed by closest proximity. For each provider in the feed, you will find the name of the business, category, distance, and a thumbnail photo relating to the service. Ratings and the source of the ratings round out the information provided. There are two menu bars just above the feed that help you filter, search, and refine the feed. A simple search bar allows you to enter a keyword search. Just below the search bar, there is a menu bar with three options – browse by category, filter, and map. The first list of categories is extremely general and includes automotive; health and beauty; home and garden; medical and dental; pets; and sports and fitness. With a touch on the category, a thorough new list of options appears. The automotive category contains basic items like tire rotation and car wash, as well as dent removal and windshield replacement. When you select a service, the feed of options adjusts to show just those service providers, and, again, the list begins with closest provider. At this point, it is a good idea to tap the filter and sort icon. The interface is similar to real estate iOS apps. The most common filters like best match, distance, rating, and price are one touch options, followed by a list of filters that can be refined with multiple taps. If you only want to search for services on sale, this is the interface for making that designation. MyTime iPhone app’s sort and filter options are impressive due to the precise parameters you can establish with simple interface. 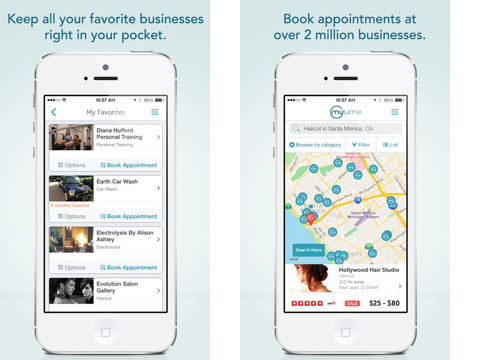 To book appointments at a service provider, the MyTime iPhone app moves you step-by-step through the process. You select a specific type of service, as well as relevant details prior to appointment selection. For example, if you want to book a massage, you select type of massage, duration, and new or existing client to find the appropriate time available. For businesses that are currently participating with the MyTime iPhone app, you can book instantly. If a provider does not yet sync its calendar, the MyTime iPhone app will contact the provider to book an appointment. Then, you will receive an email or text with confirmation information. Account creation requires a Facebook or email authorization. The Facebook authorization requires permissions for access to your public profile, friend list, email address, current city, and likes. You can opt-out of timeline posts by the MyTime iPhone app. You can also add your credit card information and access your purchase history with ease. The MyTime – Book All Your Appointments Online! iPhone, iPod Touch, and iPad app streamlines and organizes the difficult task of making appointments for you and your favorite businesses. 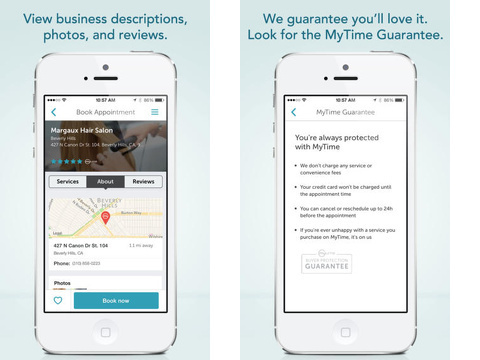 AppSafari review of MyTime – Book All Your Appointments Online! was written by Jenni Ward on November 21st, 2013 and categorized under App Store, Enterprise, Free, Productivity, Reference, Shopping. Page viewed 5636 times, 2 so far today. Need help on using these apps? Please read the Help Page. Didnt use the app but their Website, they mailed me after very few minutes to accomodate my appointment, and figured everything out for me! Mails are very personal and not Computer generated. Loved it! My time has published erroneous information about my business. They have posted information without my knowledge or consent. I would not trust this site. Plus they keep banning my review. I have stated that I do NOT want a my time page. But here it is. WITHOUT MY CONSENT.